Over the last two years, we’ve been exploring how bicycling can help small towns. It was a simple idea that we saw manifested in myriad ways when we were on the road. Fortunately, we’ve been involved in some really amazing projects that are institutionalizing the idea, like Oregon’s Scenic Bikeways and statewide Bike Friendly Business program. All of these projects have the goal to boost, revitalize, and enrich the rural communities in Oregon by bringing people through on bicycle. We’ve had the opportunity to work with some of Oregon’s great rural bike advocates to see how bike tourism manifests itself in reality. #1 Bike Tourism is Outdoor Recreation. Kim and Anita Metlin live in La Grande, OR and are the proponents of the Grande Tour Scenic Bikeway. 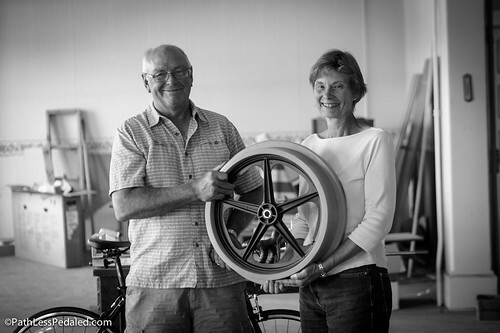 When we asked them what they had learned over the last few years, Kim put it best when he said, “No one is going to drive out to the middle of nowhere to do a two-hour bike ride.” For an area to be a successful bike tourism draw, it has to offer a wide range of experiences – everything from road riding, mountain biking, gravel grinding, etc. But beyond just biking assets, an area has to also promote other related-but-non-cycling activities in tandem (camping, hiking, rafting, fishing, arts, beer, etc.). We often think of bicyclists in a vacuum, but bicyclists don’t ride bikes 100% of the time – they have other interests as well. People who ride bikes are active travelers and it makes perfect sense to market a region’s other outdoor recreation activities to them as well. Kim and Anita’s recent venture is a pedal-powered rail car that runs on unused county-owned railroad. Currently, they operate during the summer months, Friday to Sunday, and offer three guided departure times. They built 10 rail riders and have a capacity to take groups as large as 20 people at one time. The ride takes you from Joseph to Enterprise (with a beer stop at Terminal Gravity for adult guests). What was initially meant to be a way to whimsically enjoy retirement has become quite the busy operation. When we visited, they had all-but-one pedal rail car booked for a family reunion! We chatted with people from Seattle and Bend and Texas who made the trip out to try their wacky contraption. This brought to light something else about bike tourism – activities for all ages and abilities. They’ve had kids as young as four and adults in their 90s on the rail riders. It might be the case that only one or two in a party identify as cycling enthusiasts, but something like the pedal rail car allows other members of the party to enjoy the area as well. #2 It’s about the Journey AND the Destination. Bike tourism is unique in that the journey is an integral part of the experience. We’ve driven on roads and through towns in a car that we also biked through and the difference was startling. From behind a windshield, small towns are less memorable as they pass by in the blink of an eye. On a bike, you feel like you get a more intimate understanding of a place and notice all the little details. That said, there is something to be said about the importance of building and marketing a destination that is welcoming of cyclists, particularly in remote rural areas. 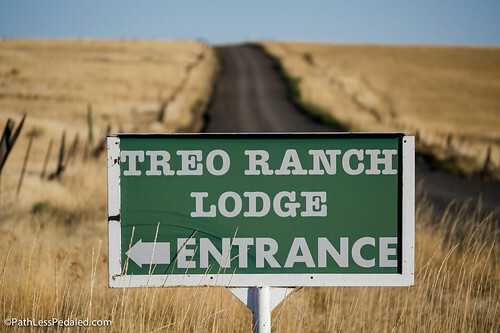 We interviewed Phil Carlson who launched Treo Bike Tours a few years ago as an offshoot of his successful bird hunting business. He was looking for a way to generate income when hunting wasn’t in season and he saw opportunity in bicycling. Phil’s property is down a four-mile gravel road from the ghost town of Hardman, Oregon. His lodge is an island unto itself which he is fashioning as a cycling destination. While he initially marketed the road riding opportunities, he discovered he was surrounded by another great asset – gravel roads. There are literally days worth of gravel (and pavement) riding to be done around his lodge. Phil’s bike tourism model is to create an all-inclusive bicycling destination. His lodge is outfitted with several cozy rooms, a common area with a pool table and fireplace, craft beers on tap (an IPA and a dark IPA when we were there), a hot tub, and even a pistol and rifle range. Not too far from the lodge is a saloon made for late nights of playing cards by candle light and drinking beer. When you book a tour, all meals, snacks, and ride support are included. For visitors flying into Portland (or Portland area residents), he offers direct pickup from the city (no need to drive!) in his fully outfitted shuttle bus and trailer. 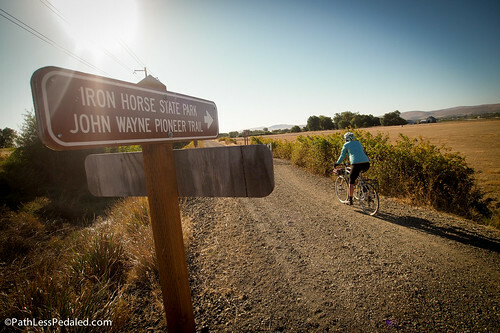 As soon as you get out to the country, you can start riding and enjoying some of Oregon’s great rural roads. While Phil’s focus is on building his business as a destination, small towns and communities can employ similar techniques on a macro scale. 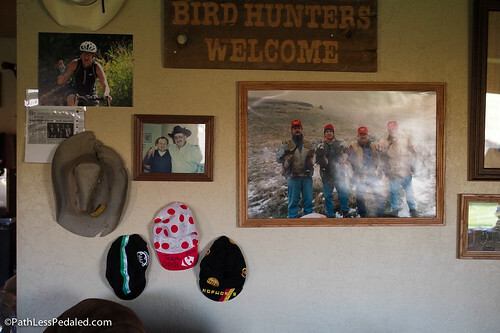 Phil’s ranch maintains its rustic personality and character (there are stuffed birds and photographs of hunters on the wall), but he has also incorporated bicycling photos and cycling caps to help cyclists feel at home. 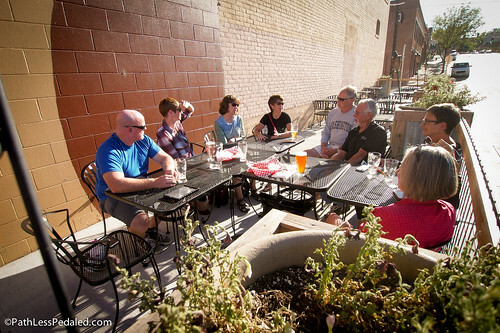 Similarly, rural communities don’t have to re-invent themselves into mini-Portlands to entice cyclists, they just have to extend the same sense of welcome as they would to their other guests (though a craft beer or two on tap doesn’t hurt :). In the end, as Phil told us, his business is all about “customer service,” whether it is hunters or bicyclists. #3 Catalog your bicycle assets. Then share them ONLINE. 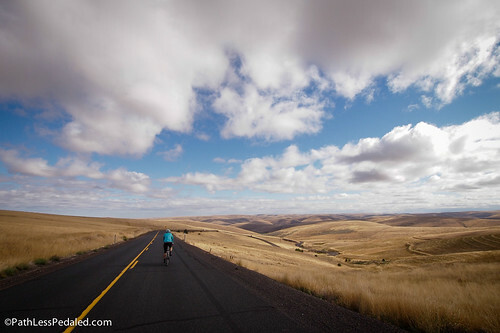 On this road trip we ventured outside Oregon, into Washington, and worked our way from Walla Walla, through Ellensburg, and into Wenatchee, where we met with local bike advocates and a chamber representative over beers to talk about bike tourism. There was a lot of interest in the group about promoting Wenatchee as a cycling hotspot. We asked them why and they gave us a great list, from favorite area rides like the Fruit Loop, to local hill climbs, to great country roads that connect to interesting towns like Leavenworth, and the fact that it’s sunny there when it’s winter on the “wet side” of the state. We asked them where a visitor could find this information and they mentioned a few websites of local cycling clubs, but none of them were visitor-facing websites. You had to already know where to look or be a part of the local cycling scene. We suggested that they catalog all of the great riding opportunities and create a purpose-built visitor-facing website for cyclists. It also doesn’t hurt to post routes across several area websites – the more the merrier. We spoke about the pluses and minuses of paper maps. As bike travelers, we love paper maps. They never run out of batteries! BUT, the reality is that people now do most of their vacation planning online. Paper maps are also expensive to do well, and the map occupies a specific temporal/physical space. What are the chances that someone who is bike-curious will check in to the right accommodations with the right person on staff who will think to direct them to the map? In terms of ROI, and for the sake of getting things done quicker, online maps, routes, and trip suggestions spread over multiple sites will yield better results. By the end of our bike tourism study tour we were both encouraged by what we saw, and we also learned more about the real challenges facing these rural bike advocates. In many ways, people who advocate for rural cycling are pioneers operating with little support from the larger nationwide bicycle advocacy organizations (who are primarily focused on cities). Despite this, they are innovating and coming up with unique solutions to making bicycling work in their small towns. I think the comments about how to attract cycling tourists are right on point. I would also make the general statement that active tourists (hikers, runners, fishermen, cyclists, triathletes, and so on) really boost an areas economy in a nice way. Usually ‘active tourists’ aren’t hell raisers at night and they like the kind of places that others like as well (sidewalk cafes, little bistros, shops, etc.). The points raised here are very good and should be relatively straight forward to implement. I especially like the visitor-facing website comments, as I do as much trip planning on line as possible, as it allows me to do that research when I have the time and inclination. Nicely done, hopefully others will read your insights and apply them, wherever they may be, as I’d like to see many more active tourist-friendly areas! We recently attended a conference in PA and wanted to ride around on local backroads while there. I found a cycling club that had wonderful cue sheets to print but what would have helped even more would have been a link to the gpx file for each route. I did take each cue sheet and make a route on RideWithGPS and then exported a gpx file for each route and that worked out fine but it would have been a nice extra. I’ve found that relying on cue sheets alone can be disastrous when in an area you aren’t familiar with. If you miss a turn or a road sign is missing, you’ll have a hard time trying to get back on cue. Good article!! Appreciate all the good points. Great article…and inspiring! The bicycling opportunities in our area are endless; however, we are struggling as to how to present them. Our logo: Mining Endless Outdoor Adventures sums up the unique variety of active adventures we offer. We are looking for someone who wants a job making this a tourist destination for biking. Hello Russ, thanks for presenting this blog post. It’s a very inspiring one and I really enjoyed reading. Most importantly I’m also trying to encourage my areas tourists to ride bikes when they visit and stays for couple of days. I’ve a bike shop Inani, Coxs Bazaar, where I offer free cycle riding opportunity as well. Most peoples are showing interest of riding and it’s a great achievement for me.